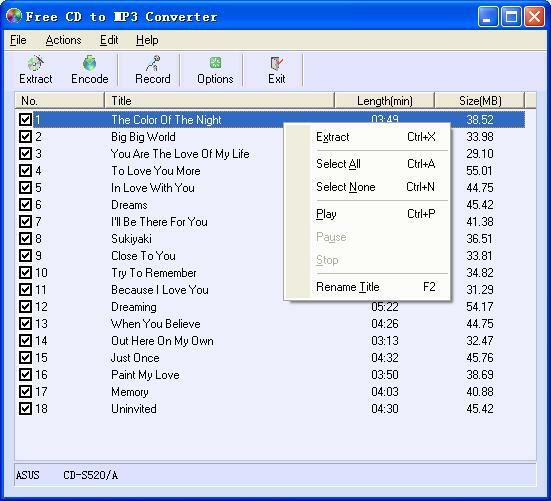 Free cd ripper software: An easy to use free cd ripper software. This CD ripper is an easy to use free CD ripper application that allows you to rip digital audio tracks from a CD to audio format MP3, Ogg or Wma with excellent output quality and high ripping speed. This free CD ripper supports CDDB & ID3 tag edit, it can retrieve disc information from remote CDDB database (the Internet Compact Disc Database) automatically, support for normalization of the audio files and supports additional LAME options. You can also use the software to record to MP3 with your microphone, or to convert WAV files to MP3, Ogg or Wma format. This free cd ripper sofware used AKRip and LAME encoder. AKRip and LAME are licensed under GNU LIBRARY GENERAL PUBLIC LICENSE. Rip selected digital audio tracks and extract them to audio format WAV or MP3. The result is WAV or MP3 format according your choice. You can change the output format from options setting. Wav to Mp3 converter, Mp3 to Wav converter. Use he Lame encoder and options dialog for professional Mp3 encoding and decoding. Support Free CDDB and ID3 tag edit. you can get the music information from internet easily and edit the music info yourself professionally. Such as Track Titles, Artist, Album, Year, Genre and Comment information. This cd ripper can normalize the volume levels of various CD tracks. you can make all output audio format WAV or MP3 in the same volume level. Record from microphone to Wav or Mp3. You can record your voice from microphone and save them to audio format. The output format is Wav or Mp3 or All based on your choice. You can select the track you want to rip and click Extract to start to extract. It's too easy. You can rip tracks of Audio CD just by several clicks. Clear the history of Windows Media Player and Real One Player. You can clear the play list history of Windows Media Player and Real One Player when they not run. What is a CD Ripper ? A CD Ripper is a program for ripping audio CD tracks to audio files. The procedure for recording a CD track as an audio file is called ripping. The software that is used for ripping CD is called " CD RIPPER" . Free CD to MP3 Converter is a freeware product, that means you can download and use it freely. Anyway we will appreciate contributions: Using the collected money to finance new development of this free cd ripper. Without your support, perhaps we can not keep adding new features. Thanks for your help. Register now. Auto Winow Manager - Auto resize programs, transparency windows.